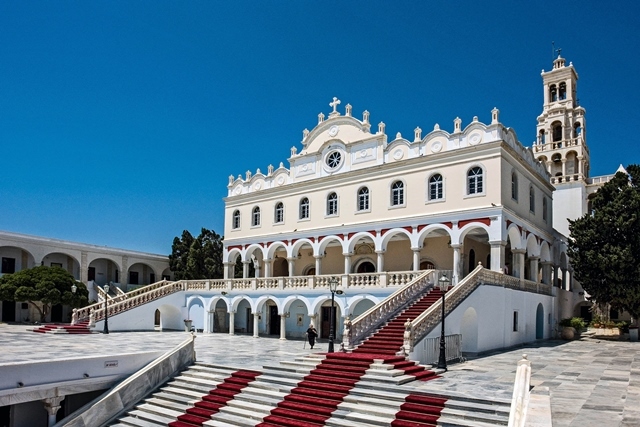 The island of Tinos is well connected to Athens with daily ferries from the ports of Rafina and Lavrion as well as with other islands of the Cyclades and Crete. Rafina is the most convenient as if you choose to travel with a high-speed ferry, Tinos is just a two-hour long journey. The ferry schedules are quite frequent (especially during summer) and the tickets are usually quite affordable. Tinos is also directly connected to Mykonos (just a 30m sail) and Andros with several daily ferries during the whole year. Travellers that want to combine Tinos with island-hopping in the rest of Cyclades, can go from Tinos to Paros and Naxos with several ferries per day (this route exists only in high-season). Once you step your feet on these islands plenty of options arise to continue your adventure there. Another idea to make your vacation richer would be to follow the route from Tinos to Santorini and Crete, which is also served by daily schedules during summer. Tinos is a very interesting island with a landscape that combines a mountainous terrain and nice beaches. The beauty of the island is focused on the extremely nice and picturesque villages that are spread all over the island. Pyrgos, Ysternia, Volakas are just a few of the villages that will dive you into the history of Tinos along with the long tradition of fine arts. Tinos is also an exceptional destination for good taste lovers. The food all around the island is delicious and authentic. The traditional recipes take advantage of the island's rich production on cheese and vegetables and form a genuine taste of Meditteranean cuisine. Tinos is renowned for the long tradition on Tinian marble craftsmanship, which has been included in UNESCO's "Intangible Cultural Heritage of Humanity" list since 2015. The most important sculptor of Greece, i.e. Yannoulis Halepas, was born in Tinos and spent a long period of his life in his village Pyrgos. Visiting his house, or the Museum of Marble Crafts would be of great interest, as they really give you the chance of diving into this deep tradition. If you like watersports, Kolybithra is one of the most famous beaches in Greece to do surfing. As the island of Tinos is quite windy during the summer, the waves that reach Kolibithra beach along with the breathtaking view, inspire surfers from all over the globe to visit this place.